We all know when it’s done right, loyalty programs are great for retail businesses – and also for their customers. But a true online retail professional is never pleased just by the word “great”. She wants to see the numbers to know how “great” that actually is. This leads to many questions: how should we measure our loyalty program? What metrics should we look at? What are the benchmarks? What numbers count as “good” or ”bad”? Let’s start with the obvious. When you are running a loyalty program, you want your customers coming back and shopping more often. You want to increase your retention. The math is simple: when you retain customers, you save money on marketing budget (and related costs). You can give back some of that money to customers in the form of discounts/gifts/coupons/etc., so they don’t go to your competitor. Retaining customers is a win-win… in theory. Of course these numbers are important indicators of other decisions, i.e. did you choose the right email subject line or do you have the right messaging on the right pages. In retail, retention means repeat purchases. Focusing on five (or more) different metrics is never good. Pick one or two instead! The best sales metrics always depend on the given business. However, quite often these numbers are highly correlated to one another, so choosing either number of sales or number of items sold will lead to the same conclusion. At this point it’s up to your professional judgement, but if you’d like some more help in the decision, I can recommend following the One Metric That Matters principle. Once you know which metric to focus on, the next step is measurement. Measuring retention is always tricky, because of two things: organic churn and seasonality. Let me explain, in detail. In the first column you see the different months. 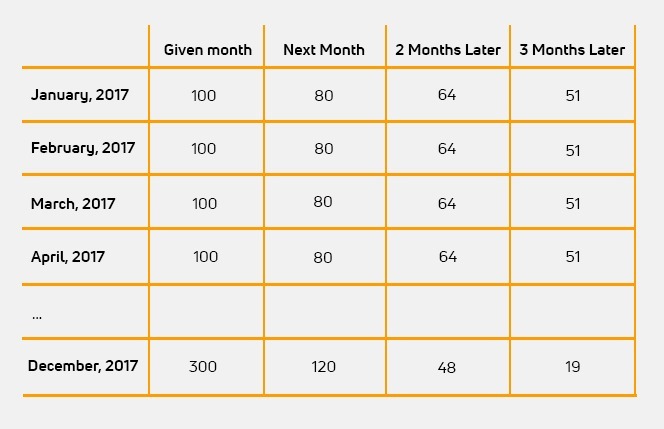 The second column shows the number of new customers in the given month (in this simplified example, we’re using 100 for each month). The third column shows how many of those 100 customers came back and bought something in the following month. The fourth column shows the same thing 2 months later, and the fifth 3 months later. See? Same performance, different numbers. If you follow this model, your retention rate will correlate to zero in the long term. Why? Simply because of organic churn. In 10 years, you’ll have a lot of passive customers. (It’s not a pleasant thing to hear, but it’s normal.) So, if you always count in this passive customer base when you calculate your retention rate, it will really distort your numbers. So, please don’t do that! A cohort is a set of customers that we can select clearly based the date and time of a certain interaction they’ve made. In this table, the row corresponding to January shows the cohort of those people who made their first purchase in January. It’s really easy to see that the monthly retention of this group is ~80%. The same goes for February, March and April. This is actually a much more informative overview of our results, than any aggregated view. 1. You can see your actual retention rate and compare the different months/cohorts! Nothing distorts your numbers, as you don’t count in the passive customers. That’s a big achievement in itself. But with cohort analysis, you can finally exclude the seasonality effect, too. In the demo cohort analysis above, it’s really easy to see that January, February and March performed the same. But if you typically push hard in December (as most online retailers do), there’s a high chance that the customers you’ll bring on board that month will return less than your average customers do. And now you’ll be able to see that clearly! 2. It makes calculating the return on your investment really easy. Having the exact retention rate for each cohort helps you to calculate your return on investment more accurately. Maybe the first purchases from a Facebook ad didn’t cover your expenses… but if you see repeat purchases in the following months, you might change how you measure the promotion’s success. 3. It helps you to evaluate your loyalty program. Cohort analysis is great, we can agree on that! Reading a table full of numbers is never as simple as reading a line chart – I admit that. But in analytics, oversimplification can translate into the loss of information. So, don’t be afraid to go with cohort analysis, because it shows you more detailed and accurate information about your retention numbers than any other analytical method. Monthly retention? Weekly retention? Daily retention? Good question. Some retail businesses have pretty stable retention. Others don’t. Think about a coffee capsule store. If people run out of coffee capsules, they go and buy – by default – without any further promotion. You don’t have to guess around it. The simplest thing is to look at your historical data and calculate the average retention window. This will require some statistical brain power – as these different timeframes could be very spread apart, but once you have a good average, you can easily set up your cohorts using that number. For example, if you see that your retention is daily, your cohorts should be broken-down on daily basis as well. If your customers are coming back only once every quarter, it’s okay to have cohorts for Q1, Q2, Q3 and Q4. I wrote about this topic in more detail and from a more analytical perspective on my blog in this article: Measuring Retention Using Cohort Analysis. Measure retention. And when you‘re doing so, focus on your sales numbers. Use cohort analysis as an analytical method. Always use common sense! Don’t follow market benchmarks, but look at your own numbers and think! If you’re measuring correctly, you’ll be much more knowledgeable about your loyalty program – and you can measure and optimize it far more easily. Interested in real results? Then download the case study about one of our clients, LUISAVIAROMA, in which we detail how the fashion retailer increased their revenue by 4.7% in three months. Tomi Mester is a data analyst and researcher. He’s the author of the Data36 blog where he gives a sneak peek into online data analysts’ best practices. He writes posts and tutorials on a weekly basis about data science, AB-testing, online research and data coding.